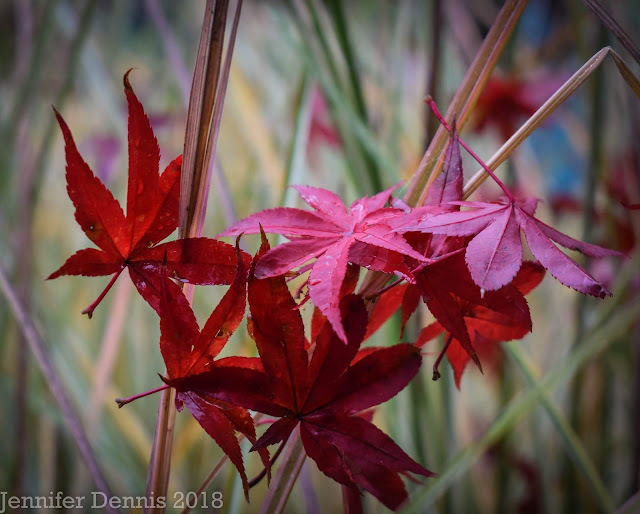 The past two weeks have been full of moisture, but the long, dry season left it's mark and produced a vibrantly colored late autumn. I strolled around the garden this morning and was happy to find many points of interest. 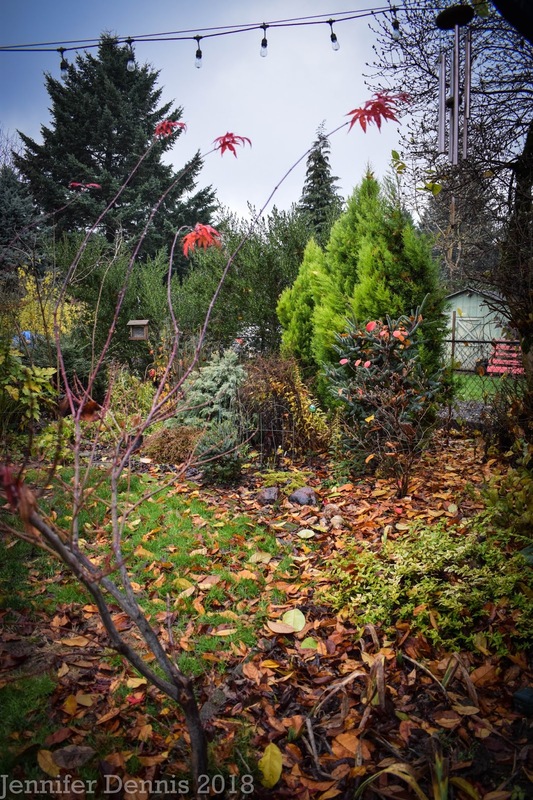 Here's a look at the Rainy Day Garden in the twilight of autumn. 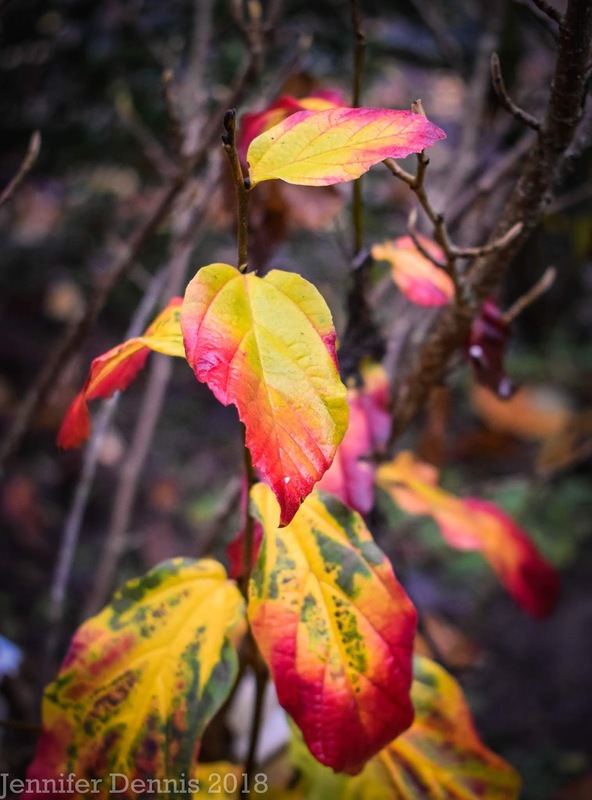 Garnet-red foliage, still cling to the branches of the 'Red-Osier Dogwood' a native to the Pacific Northwest. Usually the leaves have fallen by the time the calendar changes to December, but this year, they are hanging around a touch longer. Nearby, acer palmatum 'Twombly's Red Sentinal' dropped all of it's leaves during the mini-storm we had two days ago. 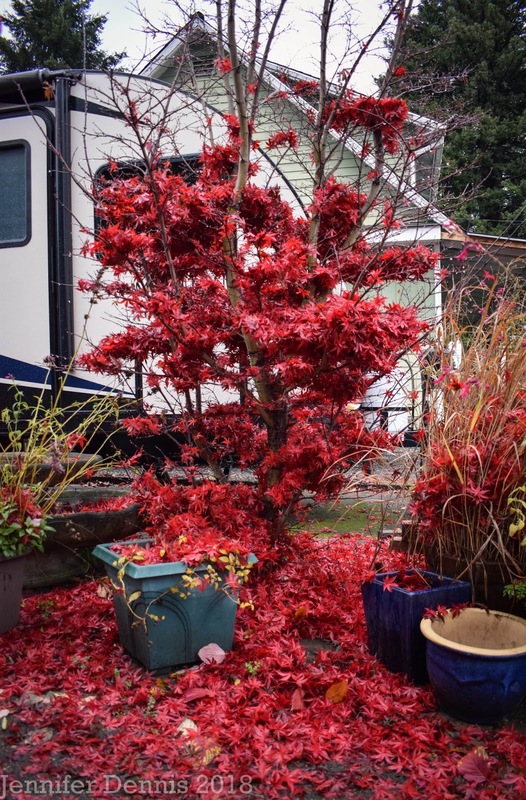 The bright red leaves have piled up and are spilling over the branches to create a gore-y scene. A few of the blood red leaves found there way to the nearby miscanthus 'Golden Light'. 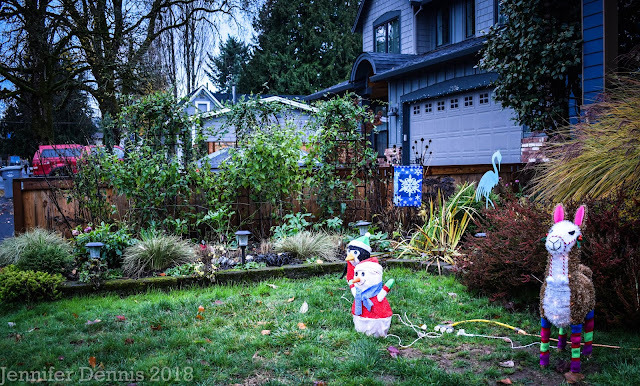 In a less dramatic scene, the front yard from a distance looks ready for winter's sleep. Holiday decorations are readying as the husband works to get the lights up during a break in the rain. But, a closer look provides a few blooms. 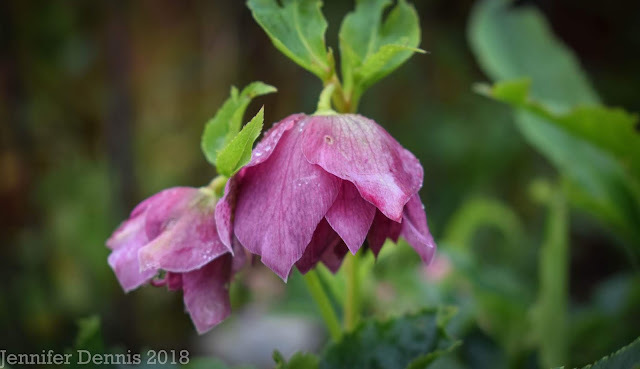 A hellebore is blooming..
And an agastache is still blooms. 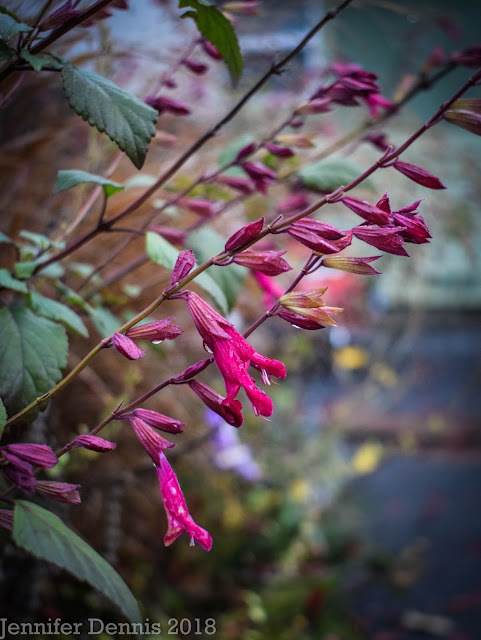 Our first hard freeze of the season should hit next week and I expect these blooms will be finished then. 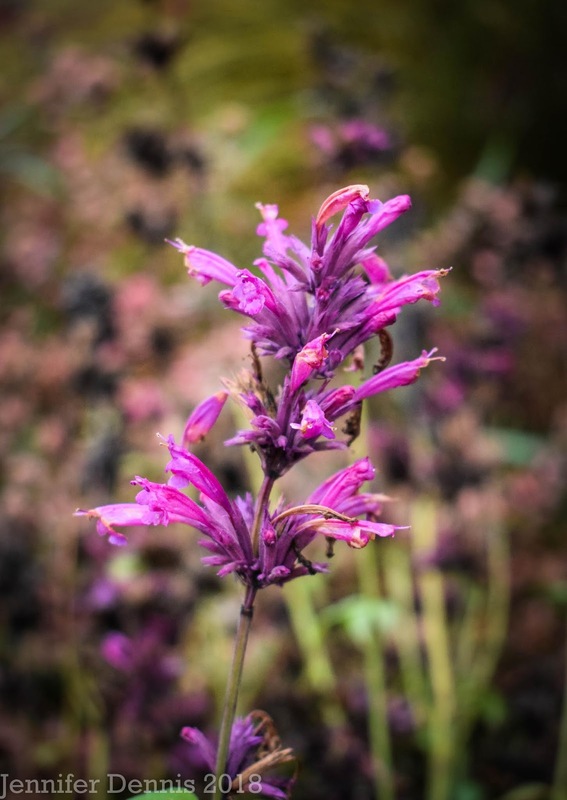 Suprisingly, a salvia still blooms. I doubt this beauty will survive the winter, but I have enjoyed the hot pink blooms all summer into fall and the humming birds also approve. My favorite of all time heath produces such colorful foliage in the colder months. I love pink-coral hues. 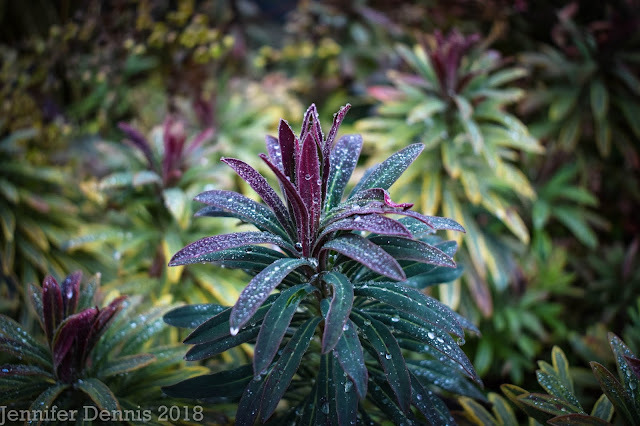 I love the way moisture gathers on euphorbia. Picture perfect. This 'Rainbow Ascot' has produced a non-conforming branch, but I like it anyway for the contrast. 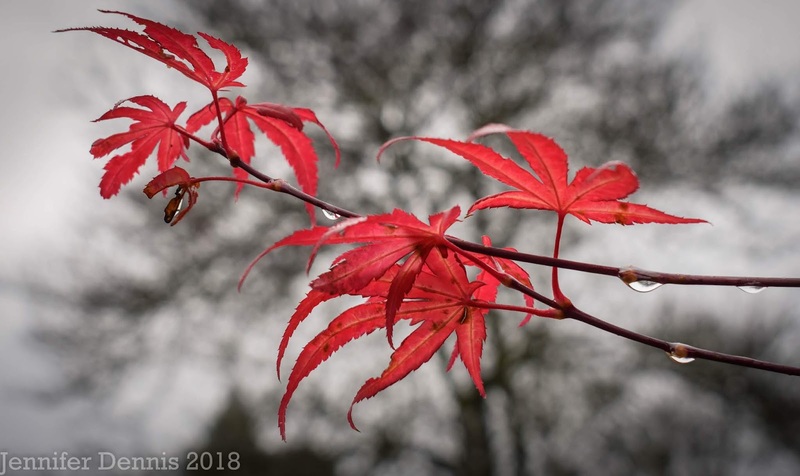 Around the house and to the backyard, I find a few leaves of acer palmatum 'Mikazuki' clinging on. 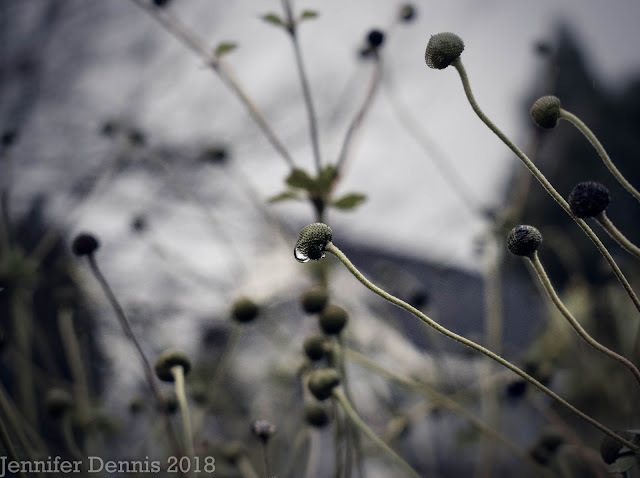 If I had to sum up the twilight of autumn in one photo, it would be this one below. I re-worked parts of the beds in the below pic this October. I'm hopeful my edits will create the look I'm after but, this is a tough corner to make work. It's ultra hot in summer as it gets the beating afternoon sun, but in winter, it's cold and damp. 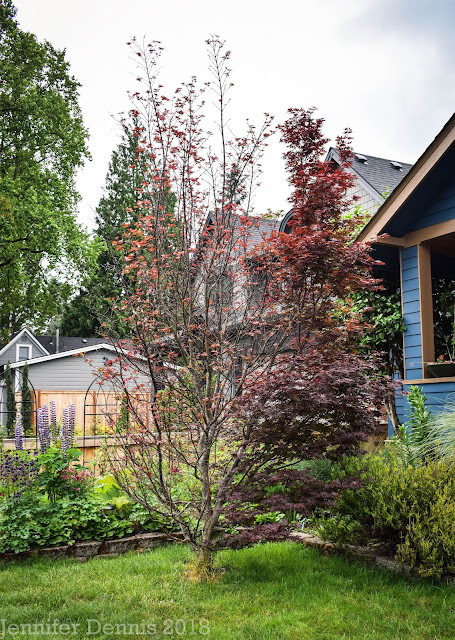 Add in the roots of a very old star magnolia tree, and it's tough to find plants that can handle all of the conditions. 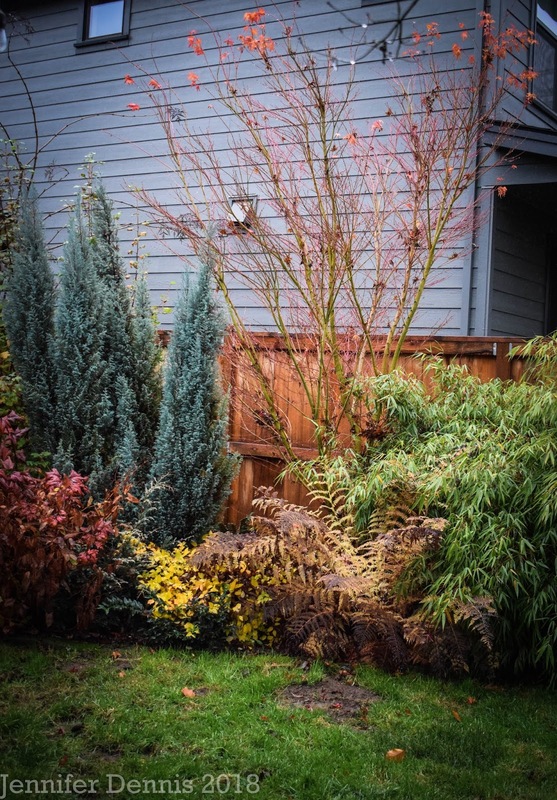 On the opposite side of the immediate back yard gardens, the coral bark maple is looking a bit naked. The dwarf conifers will be the shining stars of the winter garden, but I find that chamaecyparis thyoides 'Iceberg' just glistens after a rain shower. 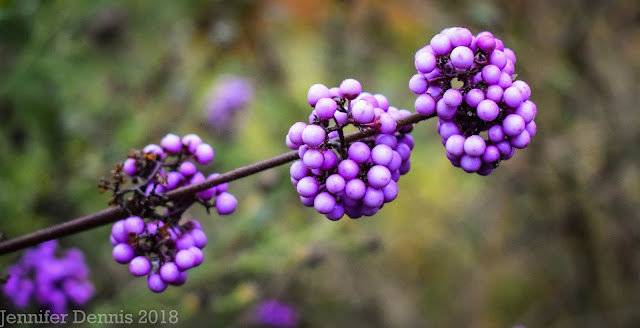 The aging fruit of the beautyberry are still colorful but, they will soon be gone. After I snapped this pic, the robins went back to finish lunch. 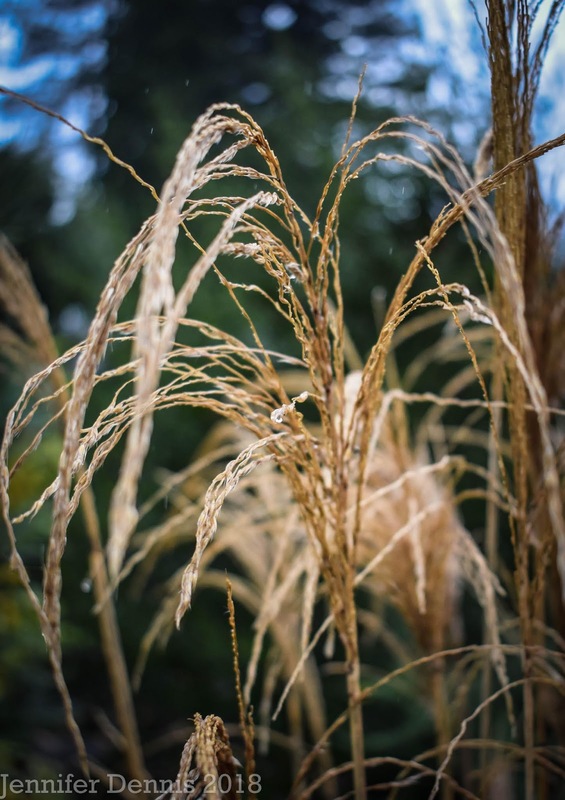 Here is a tall grass that doesn't seem to flop! I find the golden color very striking in a sea of muted hues. 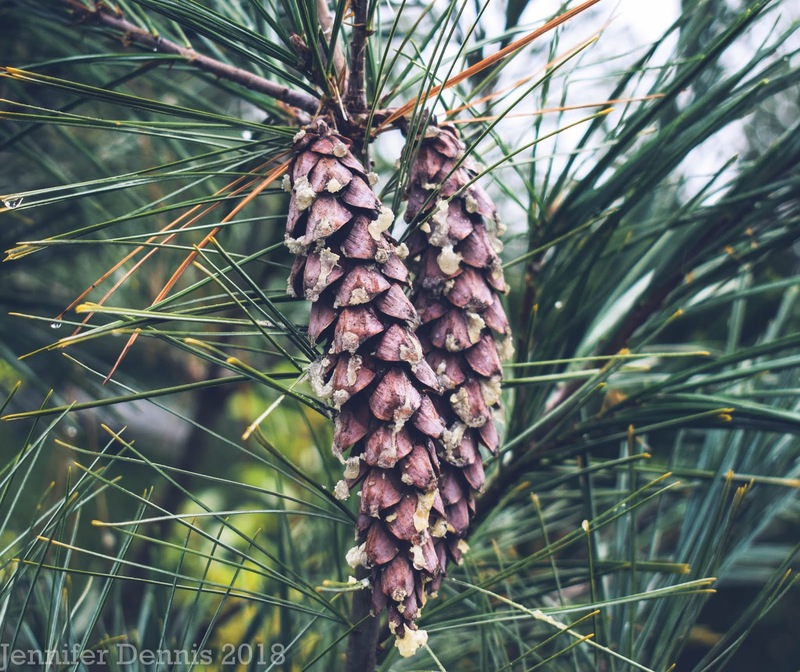 Nearby, the juvinile columnar Eastern White Pine made some pretty pine cones this year. They look elegant as winter nears. I just love this tree. The seed heads of anenome 'Honorine Jobert' look a bit alien against the gray skyline. 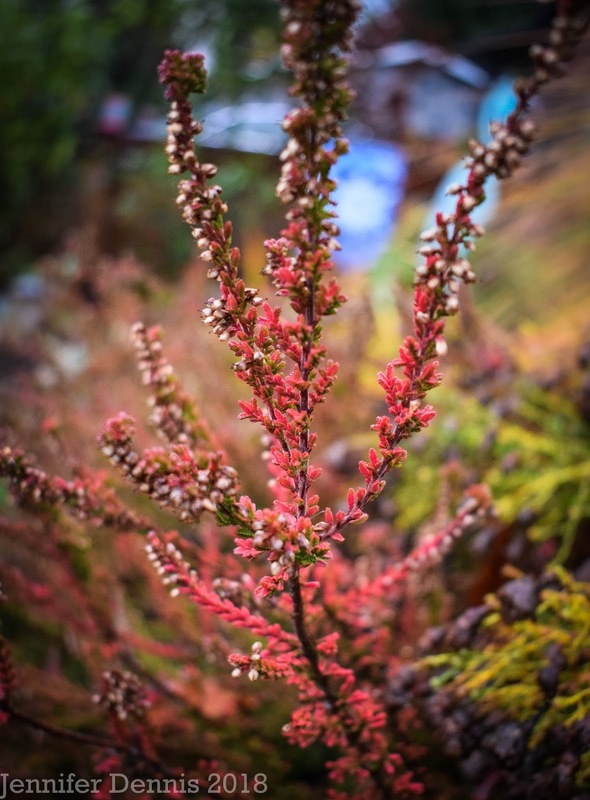 This plant produced so many blooms this autumn. It brought me a lot of joy to come home after work and look upon them. 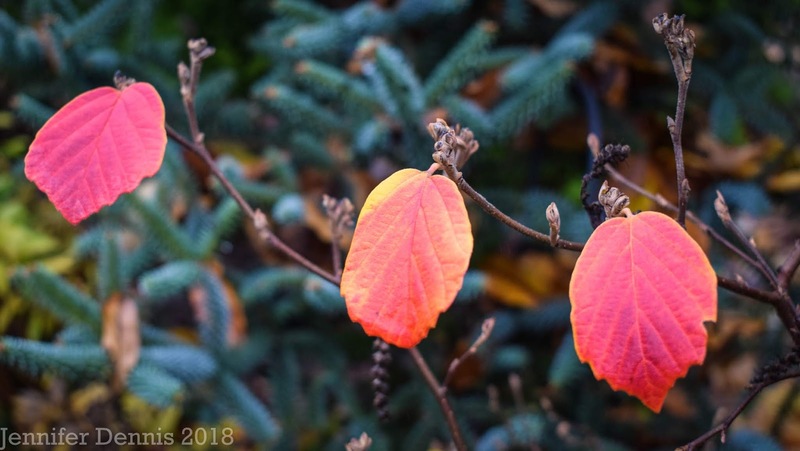 And finally, the witch hazel is showing off vibrant multi-colored foliage! Wow. 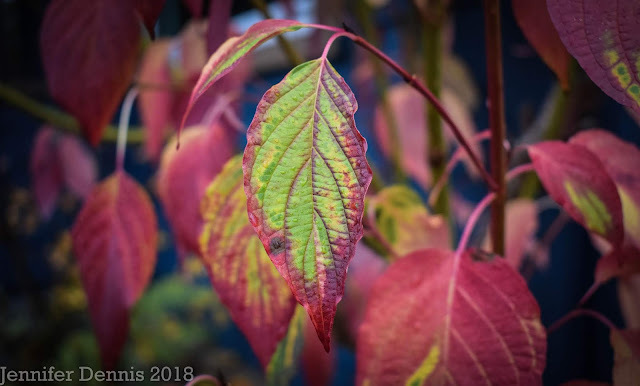 Thanks for joining me for a look at my garden in the twilight of autumn. 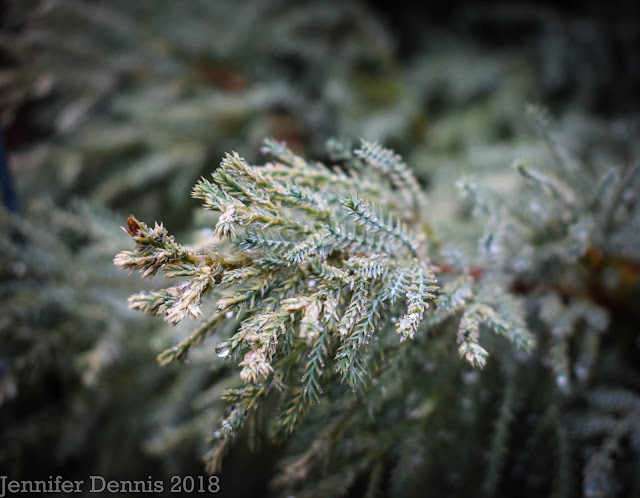 Winter might just arrive next week, so I'm glad I captured the moment. That picture of the red maple against autumn grayness is a great shot. I've reworked a few areas this fall too, it's hard going when you don't really know what the full effect will be until next year. You nailed it. I feel like I've reworked that difficult corner several times, only to find during the next growing season that it's not worked out as planned....lol!